Today I headed out to the river for the first time this year. Not that I didn't want to go earlier, but family scheduling did unfortunately not allow for any river time until today. If I remember correctly, it was mid-December when I last headed out with my friend Will for some fishing in Waterton Canyon. The weather did only partially cooperate today; I wanted to head to the South Platte but the forecast called for gusts up to 50mph. Combine that kind of wind with your ultra light Tenkara rod and you might just as well go for a hike. I decided instead to head to Bear Creek that should have been somewhat sheltered in the canyon compared to the South Platte (gusts to 20mph instead of 50mph). I arrived around 9am and it was already in the 40ies. I hoped for a nice day of fishing... I decided to fish today with my new Caddis 330 and Tenkarabum's No. 3 level fc line (wind, remember?) and wanted to put my new Tamo that I received for Christmas to good use. Well....... it seems that I still have no clue how to fish in the Winter. I worked all the spots where I would hang out were I a trout and then some. Midges, nymphs and even dries (hey, you never know). I guess it didn't help that some of the river was still frozen and snowed over and the water was really really really cold. I will have to either fish more in the Winter and collect experience and pay my dues or I should just go ski. I hear the skiing in Colorado should be really good. I wouldn't know since I haven't skied in Colorado since moving here in 2008. That is a story for another time though. Anyway, I enjoyed the day out in the sun, trying to cast and catch some fish in some of the water that wasn't solid. The review on the Fountainhead Caddis 330 and the Tamo will have to wait for another day. Hopefully soon. If you are like me, you probably picked-up Tenkara because of it’s simplicity compared to other styles of fishing or fly fishing. This approach to simplicity will probably also trickle down to your equipment. I remember the days when I started fly fishing and carrying a vest with 20lbs worth of fly boxes and any thinkable (and unthinkable) accessories. Those days are definitively over for me. Now with Tenkara, I would like to limit the amount of “stuff” I am carrying to what I really might need and rethinking what vessel is most suitable. 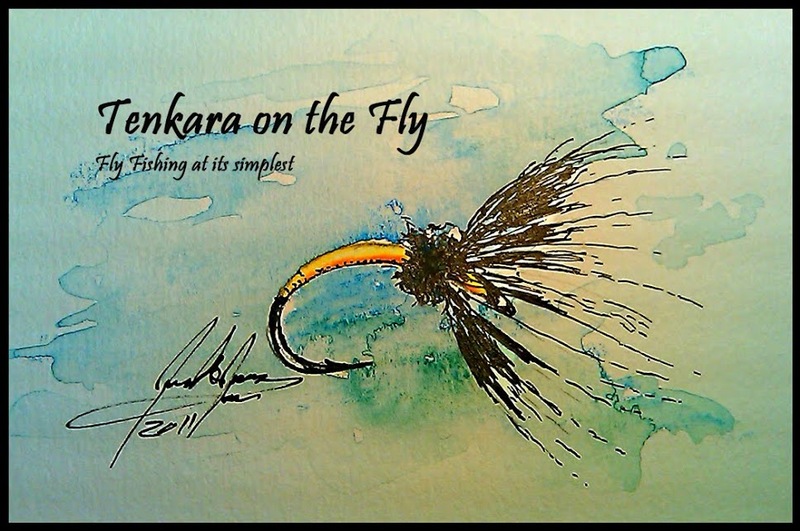 Jason Klass of “Backpackflyfishing.com” is a fellow Tenkara enthusiast that started developing his own equipment and offering it for sale on his web site. Some of you might already be familiar with the Ebira Rod Quiver, the Trico Pack and other equipment. A little while ago, Jason and I met over a few drinks talking shop about Tenkara, our experiences, equipment, ideas etc. Jason asked if I would want to test and review some of his products. I thought that would be a great idea and an honor to provide feedback that might find its way into products available to other Tenkara enthusiasts (I was of course completely unselfish). That being said, Jason was looking into improving the Trico Pack and gave me the prototype of what he will be offering this Spring on his website. The Trico Pack is definitively a minimalist approach to how to carry your Tenkara accessories. It is big enough for what you really need and at the same time small enough to keep things simple. The first improvement made by Jason is converting the floatant “cage” with a new, more versatile elastic/stretch pocket that can hold a small bottle of floatant, nippers, sun screen/chap stick or similar without the risk it slipping through the cage. The second improvement is an additional inside pocket/compartment that can hold your fly lines, a tippet spool, line holder, credit card, fishing license or something that is similarly flat separate from the main compartment where you would keep your fly box and other items. The 3rd improvement will be (and that was decided by Jason after I got the Trico Pack for review) a foam patch that can be attached to the velcro strip on the front of the pack (sorry no picture). This pack is exactly what I was missing last year hiking and fishing Rocky Mountain National Park. When fishing in the “Park”, I always carry a small backpack with hiking essentials such as rain jacket, first aid kit, snacks, water, flash light, additional clothing layers etc. Basically stuff you might need up in the high country if conditions get worse or something unexpected happens (which happens often). On those trips, I had all my Tenkara fishing stuff in the backpack so when I needed to another line, tippet, different fly etc. I kept taking off the backpack, unpack, find what I was looking for, pack and put the backpack back on. I wish I had some sort of smaller pack up-front around my neck or on the backpack strap where I could easily retrieve what I needed. The Trico Pack fits exactly that niche, holding a small fly box, tippet, fly line, nippers, forceps and even a Swiss army knife. I am not affiliated with Backpackflyfishing.com nor did I receive any compensation to review the Trico Pack, however, I received the Trico Pack free of charge for testing & reviewing.